Influenza A is a member of the orthomyxoviridae family. It is composed of eight separate strands of RNA surrounded by a protein studded membrane. Each strand codes for different proteins. Strand #4 codes for hemagglutinin. Strand #6 codes for neuraminidase. These two proteins project through the viral membrane and are used by the virus to enter and leave the host cell. They are also the point of attack for host antibodies. The proteins neuraminidase and hemagglutinin are important to viral replication. RNA viruses are more subject to replication errors than viruses which are based on DNA. Small random changes involving an exchange of one amino acid for another are frequent. These point changes can occur in any of the eight strands of viral RNA that make up influenza A's genome. If such a change occurs in strand #4, the hemagglutinin protein will be slightly different in shape. If it occurs in strand #6, neuraminidase will change. These small changes which occur during replication are known as "Antigenic Drift." As drift occurs, the configuration of the surface proteins, hemagglutinin or neuraminidase, can change. An altered configuration can render existing host antibodies less able, or unable, to attach to the virus. Consequently, the existing host antibodies are unable to block infection. Drift is one of the reasons we need to be re-vaccinated yearly. 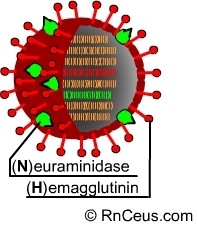 Currently there are 16 known types of influenza hemagglutinin and 9 neuraminidases. So far, only three types of hemagglutinin (H) and two types of neuraminidase (N) have been involved in human influenza pandemics. Virologists use the two surface proteins, H and N, to differentiate between strains of influenza A virus. For example, the 1918 influenza A was subtyped as H1N1. The 1957 pandemic "Asian" flu was subtype H2N2, and the 1968 pandemic "Hong Kong" flu was subtyped H3N2. When virologists compared the H1N1 to the H3N2 viruses, they can see that the viruses contain different RNA and therefore produce different surface proteins (H and N). Prior to 1968, H3 type influenza was only known to infect birds. However, in 1968, H3N2 caused a pandemic and remains a very common subtype. It is theorized that the H3 virus was suddenly able to infect humans due to what is called an "Antigenic Shift." Shift can occur when a viral RNA strand from one subtype is transferred to another. For example, if a pig cell is infected by H1N1, and simultaneously infected with an avian HxNx, the result could be some H1N1 virus, some HxN1 virus, some HxNx. The HxN1 may be a novel combination created by reassortment of viral RNA. If the reassorted subtype is easily transferred among humans, there may be no humans with antibodies to the new combination and a pandemic can occur. Hemagglutinin is the viral surface protein responsible for binding the virus to susceptible cells. Hemagluttinin binds to a sialic acid terminal on the hemagluttinin receptor. Human and swine respiratory tract mucosa, as well as avian intestine, are all rich in hemagglutinin receptors. Once hemagglutinin binds to the sialic acid terminal of the receptor, the virus is brought into the cell for replication. Neuraminidase then triggers the sialic acid terminal to allow the new viral particles to escape the host cell. Each infected host will produce myriads of virion before it is killed or the infection is cleared by effective antibodies. Shifts seem to arise in parts of the world where humans, pigs and poultry all live in close proximity. Proximity allows for the greatest amount of cross infection and results in high levels of both drift and shift. Avian influenza is usually not effectively transmitted directly to humans. An intermediate host is often required to modify the virus. Pigs are receptive to avian, human and swine influenza. Swine act as mixing vessels for the influenza A virus. This places farm workers at risk for contracting and transmitting the new reassorted viruses. New, very deadly, but as yet poorly transmitted, H5 and H7 type avian influenzas have recently been transferred to humans. So far, the number of victims have been small. However, it is important to remember how many combinations of the 16 known hemagglutinins and 9 neuraminidases have yet to be transferred to humans. Influenza A's ability to evolve and attack humans is just beginning to be appreciated. Neuraminidase binds the virus to the cells of the respiratory tract.